How to specify the image to appear for each manufacturer. What is a manufacturer logo? Why is it important? The manufacturer logo is the image that many companies want to appear wherever their products are shown in print or on the web. Many times this is a contractual requirement. Manufacturers (suppliers) often require that their distributors publish their logo in all catalogs and other promotional materials. Is a brand logo the same thing? Yes, a brand logo serves exactly the same purpose as a manufacturer logo. Many manufacturers sell their products under different brands. They want the appropriate brand logo to appear with the product information in their catalogs and other promotional materials. Where does the manufacturer (brand) logo appear in the catalog? In the Ironwood style (dynamic layout and the most commonly used), the manufacturer logo appears just above the product name. The manufacturer logo is not yet supported in the Linden (grid-based) layout, except for custom Linden implementations. If you are using a custom layout, the manufacturer logo can appear wherever you like. We have special requirements for how the logo should appear in our publications. Can you meet those requirements? Yes, we can handle almost any custom layout requirements with Plug-Ins. Please contact us to discuss your specific publishing needs. What size should we make our manufacturer logos? We recommend that you make your logos no larger than 225px wide and 150px tall. Smaller logos are fine, but we recommend that they are at least 75px in one dimension. How do I get the manufacturer (or brand) logos to appear in my catalogs and brochures? 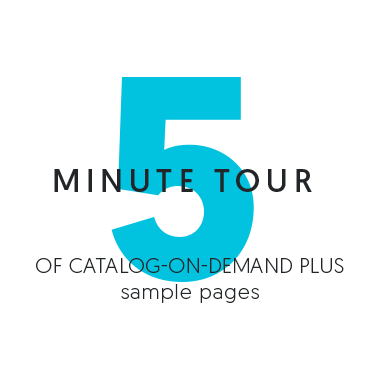 First, you need to make sure that your product content in Catalog-on-Demand contains the name of the manufacturer. This can be seen when you select your products in Catalog-on-Demand. The manufacturer name will appear in small type just below the product name. If yes, proceed with the instructions below. If no, you need to refer to the documentation for the data source you are using. Please contact us with any questions. Second, you need to upload your manufacturer logos via the Manufacturer Logo Editor. Please follow the instructions below. Most distributor catalogs require that the manufacturer logo be shown with each product. Similarly, manufacturer catalogs often require that the brand logo be shown with each product. If your product content already includes the manufacturer name, then this editor lets you associate that name to a specific logo image. Manufacturers (brands) are entered on the left side. Click New to enter a new manufacturer (brand). The manufacturer name must exactly match a manufacturer name used with one or more of your products. The logo will not appear if the name does not match. The logo image is entered on the right side. You can use either drag/drop or file search to upload the file. We recommend that you make your logo no wider than 225px wide and 150px tall. Smaller logos are fine, but we recommend that they are at least 75px in one dimension. Logos must be JPG or PNG. Move the Plug-In named "Publish manufacturer logos" from the left side to the right side. Your logos will automatically appear in your publications, provided that the style you have selected supports logos (e.g., Ironwood). If you have special layout requirements, please contact us.